informed them if the dog came back he would shoot it. End of excitement. most distant road crossing to make sure those hadn't been tampered with. little, he'd ran *hard* for a good five miles when he passed us. got to wider, better road and he was able to pass it and block the road. eventually and earned everyone's respect. reference..Verizon works at Pigeon. Don't believe any others did. sighed. Very high completion rates are tributes to high quality entries. along. Not bad for that size ride. Hey! A wonderful way to spend a sweltering day in May! May in Northern California brings weather that is nice, mild, cool, beautiful, calm, relaxed, and in general perfect for riding. It usually is, but we had a little heat wave come rolling in that turned our beautiful area into the Sahara desert for a weekend. And wouldn’t you know it, the blazing wave came in right on top of the Patriot’s 100, held in Greenville, just a hop above Quincy, which is 70 miles from Oroville, which is…….. Where in the heck is this place? It’s in the north eastern part of the state, about a hundred miles northwest of Reno, Nevada. The elevation is 3500 feet in the mountains, and it’s a really pretty spot. Ride manager Kassandra Dimaggio has put the event on for a few years now, a 100 in the spring and a 50/50 in the fall, and it’s become pretty popular. I can see why! It was my first time at the ride, having been foiled last September by the fires that were burning in the area. I love attending rides for the first time, especially 100’s. I missed most of last year due to my knee surgery; it was a very difficult time for me, not being able to ride for many months. My wife Judy and my friend Sally kept my Donnie going for me (including doing rides on him), and now that I’m 100%, it’s really nice to be back. In fact- it’s actually pretty weird to ride and never feel my knee hurt, which I have for several years. Very nice! Mister Dawn is going great guns (don’t get me started or you will never hear the end of it, as those of you who know him and me can attest to), so I’m trying to just do five 100’s on him this year and see how that goes. The 20 mule team in March was number one, which he ripped through, and this will be number two. I drove up by myself on Thursday afternoon with the grey guy, since Judy would be doing the Wild West ride the following weekend. I’m not thinking about the cost of fuel, since diesel was $4.79 when I filled up, and I noticed it was a paltry $4.98 this morning as I drove by in the Honda. The temperature was already 90 in Hayward when I left, which meant it would be really hot inland. Yep- 102 in Sacramento, 108 in Oroville! What is this, Las Vegas? I stopped for fuel ($4.69) and gave Donnie a drink, which he gladly accepted. I then drove the last 75 or so miles to Greenville, on highway 70, through the Feather River canyon. What a drive! It’s pretty slow going in the rig at 45 MPH or so, but spectacular, and lots of nice turnouts. Looking at the 1997 high water mark in the canyon gives you a shudder. If you were down here on this road when that water hit, you’d be done. After what seemed to take forever, I turned north on highway 89, looking at the river right next to the road and wondering how many cars they fish out of there every year. A few miles later, here’s a car in the river. Well, the front bumper wasn’t wet, but it was close. What a way to ruin your day! I rolled through Greenville and found the base camp, which was a nice level meadow with green grass and running water. The temp was 90 plus at 7pm- uh oh. I parked next to Jim and Cathy Gemperline from Healdsburg, which worked out perfectly, since Jim had a single horse that needed a buddy, and I had Donnie who needed a buddy. Instant friendship! I “officially” met Jim and Cathy, and they generously offered me dinner of steak, raviolis, and salad. Okay- better than my frozen green salad and polish sausage. We enjoyed a great dinner and had a nice leisurely evening talking; it’s a good thing when you don’t have to get up at the crack of dawn. Jim was going to ride his, and his horse Tommy’s first 100! He was pretty excited, and asked a lot of very good questions. Friday morning was cool, but the temps climbed all day to the upper 90s. Around 11am Jim and I went out for a ride for about an hour or so- we headed up the trail checking out the start. Very pretty- nice forest, good roads and footing for the first couple of miles. It was hot, so my ride plan was obvious- ride slow and finish, taking zero chances, taking all the time we needed to keep cool, and finish, finish, finish. Later on we wandered over to the dinner and ride meeting site, under the trees, next to a nice pond, (with mosquitoes- I hate them) but found a major police action! There were highway patrol cars everywhere, lights flashing, sirens wailing, people running, screaming! Well, okay, that’s a stretch. It turns out the local Highway Patrol office was a big supporter of the ride, providing volunteers for the ride and doing all of the cooking. There were CHP cars coming and going through camp all weekend as the officers got off their shifts and came out to the ride to help. It was the world’s best protected ride camp! These guys were really friendly and big supporters of the ride, and apparently while not working, they all barbeque in their spare time. The food was excellent! I later found out that Kassandra works for the Highway Patrol, so that helps explain it. The ride meeting was kind of different, in that since this ride was only a 100, the riders there pretty much knew what was going on. Kassandra talked about the trail, the start time, and, and, well, what else is there? The group of 42 riders seemed pretty laid back; it was a different kind of atmosphere floating around in the air. Excellent head vet Rob Lydon was very clear about the heat- he reminded everyone to take extra care. We took the ponies for a walk before retiring for bed in the very warm night air. All camper windows open, no blankets, I need a new 12 volt fan. Great- something else to go and buy. Start time was 5:30- barely light, but the air was cool, 59 degrees, and dead calm. I saddled up my little grey beast and headed over to the start with Jim. We were joined by Suzi Alexander on her big Grey named Ricochet, also known as Ricky, owned by Lynge Simone. Hmm- Tommy, Ricky, and Donnie? Sounds like a boy band. It would be Suzi’s first attempt at a 100 also; her horse Ricky had finished the VC100 twice. The start was a controlled start, sort of, at least it may have been at the very front. Once we started trotting we were flying. It was cool, good footing, but we were going faster than I wanted to, being caught up in the first 20 horses or so. It was fun, but too fast. We flew for a couple of miles until we hit the uphill where we slowed to a walk. They call this hill the zipper, a nice single track that goes straight up the mountain in about 20 switchbacks. It was a big climb at a walk up to a nice fire road where we hung a left and trotted for a while, until we climbed up to the right to the summit of this mountain. The view of the valley below was stunning. There was a nice water stop at the top; in fact the water was placed about every 5 miles- thank goodness! A downhill fire road led us across a bunch of streams and onto the meadow. The meadow. You would not believe this meadow. It was a couple miles across, green and lush, with a huge lake in the middle, trees surrounding on all sides, carpets of wild flowers everywhere, and there’s Mt Lassen right in the background. Absolutely gorgeous, stunning is a better description. The fact that the trail was a single track that wound all over did not hurt, either. We came across Ted Goppert, riding his horse that did not want to cross a creek at all. We had his horse join our herd- the mare, I think it was, stepped into the creek and went right across. What a good horse. Single track trotting in this wonderful place followed- just too much fun. The ride could have done circles around this meadow and I would have been happy. (Except for the mosquitoes) Our first vet check came too quickly at about 18 miles, where our three GAGS (grey Arabian geldings) all breezed through. Fifteen minutes of eating and we were on our way, stopping only for an adventure with a wire gate that would not close. Jim and I TOGETHER fought it, and finally just wired the stupid thing shut. We continued trotting a few miles through the forest on nice roads that led us back to common trail where we joined the long uphill fire road that we mostly walked in the heat. The water stop was at the top, and after a nice break we continued trotting on the good roads that we had come out on. 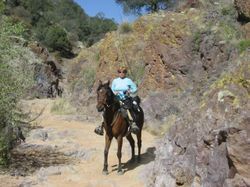 We led the horses back down the steep zipper, and onto a Tevis like rocky trail that we walked down. Back to camp and a 30 minute hold at 30 miles. It was only 10am, but 90 degrees already! We were getting ready to head out when the always happy and genuinely funny guy Mike Schackleford came over and asked me if I’d consider picking up his daughter as a sponsor, since Rachel was riding her horse Cody with her friend Jennifer, but were going a little too fast for Cody today. Sure, no problem- Rachel joined the group and we became Team Grey Arabian- the four beautiful GAGs that were romping (slowly) through the ride. We headed out on the second loop where we started climbing again, up yet another steep switchback single track, but not nearly as long or steep as the zipper. This hill was dubbed the zupper. At the top we got to trot on some nice roads for a few miles, but stopped at a creek for probably 20 minutes to cool the horses with the hand held scoops and buckets. It was hot! A mile later we turned around at the check point, where we let the horses cool more and eat. The trip back down the mountain was uneventful, until we got to the bottom. We wound through the trees on the knee knocker trail that took us through a tight forest that was really neat. Too tight to trot much, but like a slalom through the small trees. A short climb and we headed down the last ridge on the Manzanita trail- a superb single track that flowed through the chrome molly steel shrubbery that was just perfect. A water stop in a creek, where I soaked myself and mushed my rider card, and it was back to camp for our hour hold at 50 miles, right at 2pm. Boy, it was hot, and not much shade to be had. The horses were all eating, drinking, and happy though, which is what we wanted. I went into the camper and found a sauna- I had left the windows closed. Oh yuck, it was horrible in there. Why in the world would I have closed up the camper before I left? I did, though. Maybe I was worried it would rain! I made lunch and sat outside in the shade. I wasn’t looking forward to climbing back up the zupper hill in the worst heat of the day. Not to worry, though. My Donnie led the charge, er, the slow charge, back up the hill with zero protest. It was ugly hot, but team GAG motored up the hill, stopping a few times in the shade for a little rest. We spent probably 20 minutes at the checkpoint where the horses drank and ate, before continuing on down the fire roads that wound about 7 miles to the 65 mile vet check. All four of us went right through, which was good, since there were horses that were not recovering. The vet check people were great all day, as was the service for the riders. They served us dinner! Nice touch! Jim’s wife Cathy and Mike S were on hand to help out, which was very appreciated. The air was finally cooling off as we left for the long 25 mile loop three that would take us up the mountain and over to lake Almanor. We started the climb up the mountain, waiting for the big climb we had heard about. It really never came- the climb was a nice, long gradual climb up the mountain on nice roads. We trotted and walked up the grade on good roads until we rounded a turn and saw the lake from about 500 feet up. Wow- what a site. I had no idea it was that huge. The sun was getting low in the sky, the air was cooling off, and we were trotting on good roads with good horses and good people. What can get better than this? Doing it at night! The sun went down as we trotted for miles on good footing. It was here I got goofed up, mainly because I did not have my reading glasses. Yeah, that was it. I looked at the map and figured we were about a third of the way around the loop and should be coming up to the checkpoint pretty quick. The problem was the checkpoint never came. We trotted on and on, with me, who usually knows exactly where I am, wondering where in the heck we were. We were on the trail going in the right direction. (It would have been hard not to) Rachel suddenly figured it out and brought it to my attention that we were going counterclockwise on the loop, not clockwise like I thought. Huh? How can that be? Me, wrong? Yep. She had it right, which explained why we had not come across the checkpoint yet. The neatest part of the ride by far! Riding at night is just the best. Donnie led the charge, zooming along at his perfect pace, stopping automatically for the rocks- yes, he does that. Boy, he’s fun to ride. Oops- sorry, don’t get me started. We wound all over the place on the nice fire roads, all above the lake, with the full moon shining down , making it impossible to get lost. Oh yes- Dave Rabe marked the trail, and it set the new standard for trail marking. Every, and I mean every turn, spot, road, intersection, or hint of a trail crossing the main trail had at least two 20 foot long chalk arrows marking the way, and a series of chalk dots showing the correct path. Not to mention the ten thousand ribbons they used, and glow bars at night. You would have needed to want to get lost to do that on this trail. Superb job by the trail management team. Now that I knew where we were, (thanks Rachel) I decided the checkpoint was due about now. We climbed up a hill that we thought was a big climb, but it was only a quarter mile or so up to the rest stop. Hay, carrots, apples, snacks and drinks for us, just perfect. We let team GAG eat for about 20 minutes, which they all did very happily. Six miles to go back to the last vet check, which we did pretty quickly in 45 minutes. Fun, fast trotting in the dark by the moonlight. We rode on a nice, flat road back to the last check at 90 miles. We vetted through with a nice compliment- the vet said my Donnie probably looked better than any horse she had seen today. Pulse 44, running for the trot out. Okay, sorry, I won’t go on. He’s a good boy. We were all feeling pretty good about the whole thing, since we had 4 very happy and energetic horses after 90 miles, most of which were very hot miles. It was about 11:15 pm as we headed out in the moonlight for the last 10 miles or so to the finish. A very smart trail design had us heading back to camp on the same trail we had done in the daylight, so the horses knew where they were, as did we. We hit that knee knocker trail through the tight forest that became really fun! The canopy kept out the moonlight, so it was quite dark. Donnie was leading at a fast walk, and he zoomed through the trees on the trail, which I could not see at all. He seemed to be weaving back and forth, turning left and right all over the place, convincing me he was either drunk or lost. Nope- I could not believe that we were on the trail, except every hundred yards we came to a glow bar. You could see the next glow bar off ahead, but you wound around in what seemed like circles getting to it. It was really neat! Horses are so cool. We got to do the Manzanita trail in the bright moonlight, which was another highlight. All too soon the trail ended; we trotted up the road to the finish at a little after 1:00 am. All four horses looked very good , in fact Suzi’s hands were sore from holding Ricky back in the last ten miles. Rob gave them all high marks at the final vet out; he looked at Donnie and asked if I was going to just go and do the ride again tomorrow. Yeah, just perfect. 1:45 am, I’m sitting in a chair drinking a cold beer, looking at my horse eat in the bright moonlight while I’m icing his legs. Not much in the endurance world feels better. 2:00 am and I’m asleep. Sunday morning brought another warm day, and the 11:00 brunch was another nice meal cooked by those highway patrol guys again. 42 starters and 31 finishers for a completion rate of 73%. Pretty good, considering the heat. Special congratulations to Suzi and Jim for finishing their first attempt at a 100, and guess what? Lucy Turnbuckle Chipotle finished her first 100 on Roo as well. This is a long time coming and well deserved. Way to go Lucy! This was the pre ride for the National Championship in 2009, and it was a good one. Most people were talking about the heat, but I liked what a bunch of hearty souls said: “Great Tevis training!” A very hot, five hour drive got us home to Hayward, 20 degrees cooler. Donnie takes a big drink and takes off running up the pasture to go join his friends. Yeah, he’s a good boy. 40 starts, 40 finishes. 5 for 5 on 100s, including 2 for 2 at Tevis. He makes me very happy, and that’s what it’s all about. Next stop- Tevis 08. PS: Huh- as I write this two days after the ride the high in Greenville was 61 degrees, and diesel was $5.29 in Hayward. We hauled Aaruba to the Eagle Extreme endurance ride today. The 50-mile and LD entrants were well into their rides by the time we arrived around 9:30, having started from home a few minutes late because, despite hours of practice, Aaruba remains very suspicious of the horse trailer. Our arrival time didn't matter, of course, since we'd only signed up for the 10-mile trail ride. We chose a parking spot off to one side of the ride camp, which nestled in a valley among the Boise foothills. Aaruba hopped out of the trailer all eyes and ears, but well under control as I walked him around for a few minutes, then tied him to the trailer and saddled up. With thanks to all the kind people and equines who have helped me get this far, I will be forever grateful. Back in 2000 when I first learned about distance riding I never thought I could actually attempt one. Then in 2002, I found Ride Camp at www.endurance.net From the stories and information I began to think I could, maybe, one day ride a 25 mile limited distance ride. When I heard about the Malibu ride, I told myself someday, you might get to the Malibu ride. Malibu has the well deserved reputation of being the toughest ride in our Pacific South region. I have been told if you can finish Malibu with a horse that still has some gas left in the tank you could then do Tevis. I learned that the footing is hard and rocky and the hills are mean. But that is what they say about my ‘hood! And so I began to think I could actually do Malibu. And to that end I started a long journey that has been both joyous and heart breaking. At first I knew I was not fit to attempt Malibu as I was a green pea of a rider. I needed to learn everything from how to camp with my equine partner, how to drive a rig, what to bring, what to wear. I lost my first horse to a torn suspensory and then my husband in a motorcycle accident. I broke my tail bone. My right foot has been broken twice. I have a teenage daughter. But with each set back I had the memories of my previous rides with vistas and tree covered paths most riders never get to tread. The beauty of the trail calmed my soul. The good people I met and the fun of the ride camp lifted my spirits. My knowledge increased as did my mileage. My daughter and I have ridden hundreds of miles together giving us a truly unique and wonderful bond. I now have a wonderful, honest horse that loves the trail. It looked like finally, after over 5 years of dreaming I was finally going to Malibu. Then on April 16th, Lyric my daughter’s horse had a major rhabdomyolysis episode (tying-up) after a training ride. They were out. Danielle did not want to ride my horse, Jazzi. She wanted to stay home and sleep in. Then the week before the ride my rig needed hundreds of dollars of repair. And of course the price of gas just toped $4.00 a gallon. But Jazzi was ready and I was injury free. I had figured out her electrolyte issue with home made cookies. Was I really ready for Malibu? Was I ready to do it with out Danielle? As I drove through LA on a Friday afternoon my heart pounded with fear and excitement. The drive was relativity easy and the ride camp was only a mile or two off the 101 freeway at the old Paramount Ranch were many movies were filmed. The ranch is now a part of the National Park system, both good and bad news. The park has saved the land from development and thus saved the trails. However the parks’ rules (No vending, no grazing just to name 2.) makes hosting a ride very difficult. Barbra and Lisa did a magnificent job as ride manager and secretary working within the stiff framework of the park. Suzie, a Malibu resident and friend from NATRC rides greeted me when I arrived and hooked me up with Suzanne who boarded her horse, Dancer close to me in San Diego and wanted some one to ride with. Jazzi and I rode the first 5 miles or so of the start/finish that Friday evening. It was beautiful! The terrain was a cross between Elfin Forest and Cuyamaca; the coast and the mountains. Jazzi was so pumped up I had to fight her to turn around and come back to camp. In camp a moving memorial to the late ride vet Dr. Hewitt was held. Many funny stories were told and people were laughing so hard they were crying. Hugie as he was known was one of a kind, he is very much missed. My heart ached with my own loss and I was thankful Jazzi was still saddled up as I could ride some of the pain off and talk to Jerry. I asked him to watch over us and keep us safe. After a dinner and the ride meeting it was time to finish packing 2 crew bags. With the unpredictable weather I had to put just about everything in the bag for vet check 1 and 3. If the fog rolled in it would be cold and damp requiring blankets for the horses. If it was hot sponging supplies would be needed. All too soon it was time to shower, set my phone alarm and get to bed. Because of the neighbor’s request to keep the camp quiet coupled with a dead phone, I did not get up until 5:15 a.m.; 45 minutes before the start. This sent me scrambling to feed Jazzi, myself, dress, tack up and get to the start on time. As we headed out, Jazzi was more than a handful, dancing with small bucks added for punctuation. She wanted to go and go fast. We had been warned repeatedly to save our horses for later as the course was demanding. Thankfully Jazzi soon settled down with Dancer and Suzanne setting a good pace alternately trotting and walking as the terrain dictated. In a matter of minutes we passed the old M.A.S.H. set now marked by a rusted out jeep. No signs of Hawkeye or Hot Lips were found. Someone had removed the turn markers for the first hill climb. But Suzanne had many training rides in Malibu and kept us on the correct trail. We turned left and started climbing the infamous Bulldog Hill. Up and up the side of a mountain on a rough, hard packed fire road we went. The road had deep gouges in places with loose rocks. We were surrounded by late spring flowers and thick chaparral. I saw several different kinds of sages I had never seen before with bloom spikes of shocking pink, deep purple or orange up to 3 feet in length. The hill was never ending; it went on and on and on. I was told this hill was a 5,000 foot long climb. The horses were well matched and took turns leading and following. Jazzi’s heart rate monitor worked well and she was happy to continue climbing. I was starting to get really hungry as I had very little to eat. Luckily Suzanne had an energy bar we shared that got me to vet check one at 8 miles from the start. Jazzi and Dancer pulsed in at vet check one in 3 or 4 minutes. The criteria was set low at 56 (beats per minute) to ensure the horses were fit to continue due to the tough terrain. Jazzi did not want water; she wanted food. She ate and ate and ate. Good thing as she only had a C on gut sounds, but was well hydrated and sound. I too needed to eat and found energy bars in my crew bag with my sunglasses. I made a tactical error when I swapped out my regular glasses for sunglasses. I should have kept my glasses in my pack with me. The view from the vet check one was just magnificent with a deep green valley on one side and steep, craggy hills giving way the deep blue Pacific on the other. The valley view reminded me of the hills of the north shore of Kauai, so green and lush from the generous winter rains. However, this vet check was the origin of the huge Corral fire that marked the start of the disastrous Southern California fires of 2007. It was easy to see why one would be drawn to this wide spot on the road to party on a warm fall night. The scars from that fire were hardly visible, covered by new growth soon to be tinder dry in a few weeks, again to become potential fire fuel. In 20 minutes we were off trotting down a beautiful single track trail into an oak and brush lined canyon with numerous small creek crossings. It was still cool and the horses were happy to continue on. However Jazzi started to stumble small at first, but worse as the morning continued. We also started to encounter other trail users, mountain bikers and hikers. Everyone was courteous and kind and all made room for us on the trail. Jazzi sniffed several hoping to find a treat and Dancer did not spook at any walking sticks. On a steep downhill we were found by Lynne Glazer, photographer extraordinaire. She warned us the last part of the trail was bad with deep erosion gouges and lots of rock. At the bottom was a trail head with lots of horse water. Both horses drank deeply. Jazzi’s left hind shoe had started making noise just past Lynne. I found it loose and at Suzanne’s urging was able to get an easy boot over it. Suzanne called Suzie who was at the lunch stop to ensure the farrier would be available. Off to what turned out to be the steepest and longest hill (mountain?) climb I have ever encountered. It made Bulldog seem like a pleasant dream. It just never ended. When you thought you surely were done you would round a corner and find it continued up with no end in sight. The footing was fine, a hard packed fire road with sections of rocks and ruts, nothing unusual, just steeper and longer than I could ever imagined. After what seemed like hours we reached the peak. The view was stunning. Framed by green mountain sides waves danced onto the famous Zuma Beach and a bit of fog hugged the horizon. To our left was a large ranch entry named “Buzzard’s Roost Ranch.” To our right we found large water buckets filled with horse water. Both horses drank well and we let them rest a while and nibble on the dry grasses. Jazzi ate her electrolyte cookie happily and asked for another one. With one dose per cookie I had to say no. Now it was time for the longest, steepest down hill I have ever done. First Suzanne and Jazzi had to water the roadside, together. Then we encountered a large group of students working their way up the hill. They had water and were happy to be out sweating on the side of a mountain, “working on their six packs” they laughed as they pointed to their fat free mid sections. Suzanne and I had a really good belly laugh at them (pun intended). Soon it was apparent to me Jazzi was tripping worse and worse. Her easy boot stayed on, but it did not hold the ground like a steel shoe. She was slipping and sliding and tripping all at the same time. I was starting to get frightened Jazzi would fall and we would go off the mountain side. Suzy Kelly galloped by us going home from the lunch stop. We were stunned at her horses’ amazing athletic condition. Was that horse a one in a thousand or did Suzy have some secrete sause? Maybe Suzy had a fool proof conditioning program. Whatever she does, Suzy Kelly’s Cayenne Kate is one hell of an athlete. Unfortunately, they had gotten off course early in the ride and were given a completion only. Bummer. The last leg of the down hill into the one hour lunch break was a steep single track. About 100 yards into it was a large dark spot that turned out to be soft. Jazzi went down almost to her knees and grunted as she righted herself. I was so scared I started to cry as I heard my daughter’s voice telling me not to leave her an orphan. About a half a mile further down Jazzi tripped again. She again almost went to her knees. I started dreading the ride back to camp knowing most of the earlier up hills would now be down hills that would have to be trotted to finish in time. The dread just grew and grew. True to his word the farrier, Ed Spitzer was waiting for us with his grandson and work truck. First we pulsed down within several minutes and a few sponges of water. I was feeling really beat up and Lynne Glazer was so kind and held Jazzi while she ate and had 2 back shoes replaced. I found some food and drank water, Gatorade and more water at Lynne’s motherly advice. Jazzi ate and ate and ate. She drank well too and ate her electrolyte cookie happily. She vetted out fine, sound and strong. Then the vet told me if I had any thing that made me feel my horse would not make it back I needed to pull now as the ride back to camp was just as brutal as the first part. Tears of relief flooded my eyes, I did not have to finish. Jazzi’s tripping was horrible and I knew she would hurt herself or me if we continued. It was better to pull now and not get stuck were they could not trailer us out. I saw my daughter’s smiling face in my mind and knew it was the right thing to do. As we waited for the trailer to take us back to camp Jazzi’s back dried out. Once dry, new hair loss and a small raised area just behind her left wither became apparent. Her back was very sore to the touch. I was thankful to know the reason for her tripping, but mad at my self for not discovering it earlier on our training rides. I felt horrible and responsible for the pain Jazzi suffered. Lucky for me Jazzi is a kind and forgiving horse who has always tried to please me. I am grateful to be owned by such a sweet and honest mare. Of the 47 starters in the 55, 11 were pulled. Most of the pulls were for lameness, two had metabolic issue, but no treatment was needed. The 25 milers had similar statistics. I have an appointment for Jazzi with a saddle fitter. I am happy to report Jazzi did very will with the electrolyte cookies, no strange sweat patterns. I will never leave my glasses in my crew bag again. I will get a wind up alarm clock for the RV and use it. Breakfast for the rider is as important as breakfast for the horse. Every ride has taught me things. I am thankful for the lessons of Malibu; I will be a better rider because of it. Am I sad I did not finish? No, some days are like that. Life is not all cherries and ice cream. I am grateful Jazzi was not injured. I am thankful the vet sensed I had a problem and gave me permission to pull. Will I attempt Malibu next year? Maybe, if the Gods find it in their hearts to let me try again, I may do just that.